Right before I head out to New York Comic-Con, Warner Bros. and DC Entertainment hits us with a very Comic-Con-y announcement. 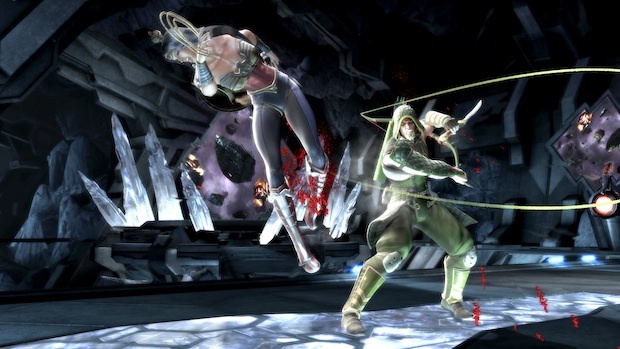 Superhero Green Arrow will be a playable character in upcoming fighter Injustice: Gods Among Us. A new trailer shows the goateed badass himself shooting up his enemies with style. It looks like distance is his game, but apparently he can still get close and do some damage. We'll get a better idea of his playstyle at New York Comic-Con this weekend as Green Arrow will be playable at the DC Entertainment booth. In related news, the official boxart has been revealed. You'll find an image of all three (Wii U, PS3, and Xbox 360) in our gallery.